VAISHALI Samant, who has been working hard to make her mark in the music industry, has been noticed at last with her debut album Aika Dajiba, released by Mumbai-based music company Sagarika. This album, especially the title song Aika Dajiba that was created by fusing Marathi folk music with western beats and rap, has got a good response, says Vaishali. This song has attracted a lot of attention, what with a well-shot video which features actor Milind Gunaji along with lissome Ishita Arun, daughter of Illa Arun. The music video of foot-tapping number Aika Dajiba has been shot in Bangkok by famous cameraman and music video director Jagdish Mali. Vaishali’s voice has given the eight songs a freshness that is much needed in the music scene today. Terming the making of Aika Dajiba one of the "most memorable experiences of her life," Vaishali says the songs in her album were composed by music director Avdhoot Gupte, who also makes his debut with this album. Avdhoot has displayed his grip over Indian and western music. Vaishali Samant in her short career span of five years has created waves in the world of Hindi film music. She started learning music from the tender age of eight under accomplished Natya Sangeet exponent Jyotsna Mohile. She received formal training in Indian classical music from Katti and Shree Jayant Datar for five years. She went on to learn the technique of blending Indian classical with western music from Guru Pandit Manohar Chimote. Vaishali started her singing career with Marathi songs and went on to become the most-sought-after singing star in the Marathi music industry. She has already sung more than 2000 songs in Marathi. She also went on to sing for numerous serials and has lent her voice to hundreds of jingles. Known as the queen of remixes in music industry, Vaishali has scores of remixes to her credit like Tu tu hai wahi, Dilbar dilse and, more recently, Jab chhaye mera jadoo to name a few. In Bollywood, she has sung for composers like A.R. Rehman in Lagaan, Taal, Tujhe Meri Kasam, Kaise Kahoon Pyar Hai and more recently Vivek Oberoi and Rani Mukherjee starrer Saathiya. Vaishali Samant has also sung for famous music directors like Ismail Darbar, Viju Shah and Daboo Malik. 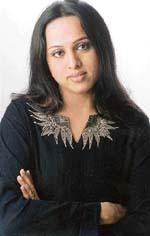 Apart from Hindi and Marathi, Vaishali has sung in Gujarati, Bhojpuri, Assamese, Tamil and Telugu. The ease with which she renders pop and rock numbers as well as bhajans and romantic songs amply displays her versatility as a singer. She has performed numerous live shows with artistes like Sukhwinder Singh, Shaan, Suresh Wadkar, Anuradha Paudwal and Anu Malik. Aika Dajiba has brought Vaishali the attention she had been wanting and she describes the response as ‘warm’. What next? "I would like to sing for all music directors and cut more albums", says Vaishali.